Request Quote - Advance Stamp & Sign Co.
Advance Stamp & Sign Co.
Our organization has had a working relationship with Advance Stamp for over 5 years and we have nothing but praise in the way they conduct their business operation. The work is done in a professional and business like matter and the staff is extremely friendly and helpful. I’ve been using Advance Stamp for over 7 years to produce signage for my commercial office buildings. They have always been responsive, professional and provide great products at reasonable prices. I am happy to recommend Advance Stamp as often as I can to my tenants and to other Property Managers. I just want to take a moment to thank you and your staff for the great service that you have given us here at Aramark over the years! The nameplate signage that you create for our staff workstations have worked great over the past years and we will continue to use this product and service from your company. 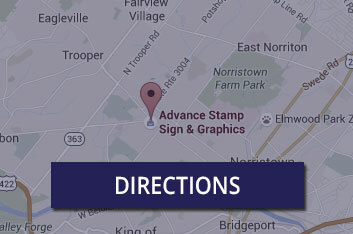 The team at Advance Stamp and outstanding customer service made the ordering process for our business quick and easy. They worked with us to come up with the best design and turnaround time is always quick. Quality products and service! I’ve enjoyed working with Advance Stamp & Sign for several years now, not only have they provided a quality product but they’ve always provided quick response times. Curt Heller, Reading Crane & Engineering Co.